After the excitement of the opening triple-header of Dunlop MSA British Touring Car Championship races at Brands Hatch, attentions switched to Leicestershire and Donington Park. Andrew Jordan laid down his marker in Kent with pole position and two wins, but this time around it was the turn of the MG KX Clubcard Fuel Save drivers Jason Plato and Sam Tordoff to set the pace. Pole was secured by two-time champion Plato, and while he and team-mate Tordoff went on to secure the first two wins of the day, perhaps the standout moment of the weekend came in the final contest. Colin Turkington had led the race from the start, rocketing to the front of the huge field in his eBay Motors BMW off the start line, and for much of the running it looked as though he had victory in the bag. With just a handful of laps remaining, however, a challenge emerged from 2012 BTCC champion Gordon Shedden piloting his new-for-2014 Honda Civic Tourer. The supersized speed machine had already scored a first podium in the hands of Shedden’s team-mate Matt Neal, but on soft Dunlop tyres, Shedden had a first win in his sights. With five laps remaining the Scot had just under five seconds to find between his Honda and the rear bumper of the BMW, and with Turkington seemingly struggling for traction, the gap closed by one second with every tour of the Donington Park National configuration, leaving Shedden just inches behind as the chequered flag neared. With a superb slingshot out of Coppice Corner and onto the final straight for the final time, the #52 car pulled alongside and just edged ahead in braking for the last chicane. 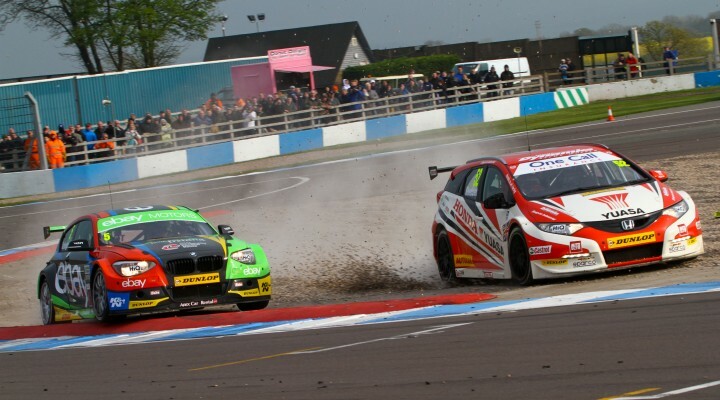 As Turkington tried everything to hold on up the inside, the pair simultaneously slewed across the gravel, and Shedden just emerged in front at the line. It was an impressive first win for an ‘estate’ style car in the BTCC, the first of four in total for Shedden and Neal in 2014.